Guess what we finally got? Makenzie got a package today that had her very own TALKER inside!!!! I am so excited for her and can't wait to put her words into it! Of course I had to play with it a bit and have decided I have a lot to learn! In Momma Bear style I WILL learn how to modify this piece of equipment just like all of the rest of her stuff!! At this point however, I am sure her therapist is going to have a good laugh when she sees what I managed to mess up in a matter of 10 min! LOL!!!! No bigggy though!!! LOL! It was a good Monday! Makenzie went back to school today for the first time in about 2 weeks! She just loves school! I spent most of the day standing outside the classroom and also had a long talk with the Special Education teacher as well! We have had many a meeting after which I have never left feeling great about any of it but today was nice! I was able to talk without a whole audience of people with a pen in hand taking notes. I am still going to have a fight on my hands in the quest to keep Makenzie in preschool for a 3rd year. Most all of her goals are social and I just can not see these being addressed as well in a Kindergarten classroom. On top of the fact that she will turn 5 only one short month before school starts! I am pretty sure I would have kept her home an extra year accident or not! Please pray for God to move his hand in this and to give me peace! This is a huge source of stress as it is something that I feel will affect the rest of Makenzie's education. Also please say an extra prayer for my mom and the doctors that will be reviewing the MRI results that she had done today. Pray that they find NO cancer cells! If they do pray that the doctors can formulate a care plan that will be successful in curing her quickly, without pain and sickness! Sunday! Doesn't it say somewhere that this is a day of rest? Hmmmmm not so much in this house! Makenzie was in a great mood all day and she ate well! Much better then the last few days! I am so ready to get back to our normal schedule this week! I love my kids but when they have extra days off it really screws with my OCD! Ok I really don't have OCD but some days I swear I am close! Over time our schedule has become a bit less ridged but for me to stay sane there are things that just can't be deviated from! It felt so nice to have everyone in bed by 8:30pm because it is finally a school night again. Every time the kids have time off of school I ask myself why I be drudge it so much! Today I was talking to one of my best friends and I was able to put it into words. I love my kids! I even like my kids! I have 4 really GREAT kids! It is not that I don't want to spend time with them, it is that we are still not able to do the things that we used to do before Makenzie's accident! When they used to have vacations we would go and do tons of stuff! We had season passes to the Children's Musuem, The Zoo, 6 Flags, and The Museum of Nature and Science. We would pick up on a whim and just go! When they fought we would go have a picnic at the park or take a bike ride. I took them ice skating, roller skating,and skate boarding often! I thoroughly enjoyed taking them to soccer practice and took great joy in watching them get all dressed up in their uniforms for the games! We used to go to the pool every day during the summer and we had so much fun throwing the ball, dunking each other, playing tag and showing off our best cannon balls on the diving board. We still do some of that stuff but most of the time I get to sit and watch from the side lines! If I do go and do something with just the boys, which is a rarity, I feel guilty because Makenzie is missing out and it just doesn't feel right without her. This is not a pity party at all! It is reality. It is ok! I love ALL of my kids and I know that in the end ALL of them will be ok! It was just nice to put feelings into words tonight! Even though my friend didn't have any answers for me, it was refreshing to remember so many great times with my kids from before March 25. I want to enjoy my kids like that again! They want to do those things again! Vacation is boring without that fun stuff! With God's help and Grace we will get to once again! Below is a few lines of an article I found on another one of my good friends sites. I didn't copy and past the whole thing as it was long! It is a description from a paramedics eyes of the scene of a child who has drowned. That is not what happened to Maknezie but minus the water part it is exactly what happened to Makenzie. If you are interested in reading the whole article you can find it here This is the last portion of it. This part stood out to me tonight as it is so true of my family's life today! Forever changed! "There are always a lot of victims when a child drowns. Someone will feel responsible for years to come. Marriages will often end in divorce due to the intense guilt and blame. Siblings will miss their little brother or sister, they will struggle to understand what happened and they will wonder why family life has forever changed. And to anyone who thinks this can't happen to them, please understand that the parents of every drowned child once believed this too." I Believe that God has a plan! I have hope in healing! Life is good!... Prayer works! Today we took a much needed Time Out! I feel like I have been going none stop now for as long as I can remember and I blew the whistle today! Makenzie and I didn't get out of our jammies until 5pm just in time to take a bath and get back into jammies again! We had a great day! The boy's were generous and let me sleep until about 8am! I came downstairs to find the Christmas Tree and all of the decorations in the hallway! They were rip roaring ready to go and I was thankful I didn't have to lug all of the Christmas stuff up the stairs! We had cinnamon rolls and OJ for breakfast. Followed by hot chocolate topped with whipped cream and of course the first candy canes of the year! Putting up the Christmas Tree was a ton of fun! I have decided that who ever invented the pre lit tree deserves some kind of serious award! The boys are getting so big! They are such a huge help and so much fun to watch! Makenzie thought her candy cane was GREAT and she just loved watching the tree go up! She helped put on a few ornaments and especially enjoyed all of the ones that played music. Then we put up the Nativity Scene and talked about each piece before we set each one in it's place! I just love the Christmas Story! Well this year I decided since my oldest is 12 and I really haven't ever had "that" talk with him that I would explain exactly why the way Jesus came into this world was so special. About how it was so amazing that the "Virgin" Mary... with explanation of what that meant...could be pregnant! Yeah... horrified! Oh boy! The rest of the day we just hung out! The boys played for a while with some friends and then we watched a movie and just cuddled! Very nice! Now my Time Out has come to an end and it is back to the grind! I feel refreshed for now and that is good! The roller coaster of life! It is funny how one second you can feel on top of the world and 2 seconds later you feel like world is falling down on top of you! Today was a day where I swore the sky was falling! Nothing really good nor bad just to much to do! A little girl with a snotty nose who didn't want to eat, 3 boys that did not want anything to do with helping around the house and fought nearly all day, a messy house that needed to be cleaned so that we can put up the Christmas tree, and a tired mommy! Makenzie seems like she is getting a cold. 2 of the boys have been stuffy and coughing so I am sure that is what it is but she isn't really acting sick other then a yucky nose. I kind of gave up on the eating thing today. I offered her food and she did eat but not what she needed to, so I just pushed the rest through her G-tube. She seemed to handle that well. Please pray for patients with this! I am so glad that she is eating but it is soooooo exhausting! It is a puzzle that is really hard to figure out most days! Wondering why she wants to eat one day and not the next. Figuring out how much she is eating and how much she needs in the tube. Trying to decide when she is just not hungry and whether or not I need to add extra formula at night. Worrying about if she is asperaiting. Hoping that she is gaining weight. Feeling like we failed when she wont open her mouth or crys. How far do you push. When do you stop! God is in control of this but today I was really wondering why it is excatly that I want her to eat! The J tube had become sooo easy! I do want her to eat! I know that nothing with her is fast but as with many other things with Makenzie there will come a day when the tube will become a thing of the past and I will hardly remember the struggles of today! Please PRAY! The boys are super excited because tomorrow morning the Christmas tree will go up! Now I just have to figure out how to get the tree up the stairs! Haul the boxes of decorations from the storage room, and still have a back! Fun stuff! LOL! I am so excited! Today, we take time out to give you thanks for all the tremendous blessings we enjoy every day. Even in the midst of our difficult circumstances and the trials we face, we recognize that we have been the recipients of your mercy and grace. We thank you that no matter what we are going through, we have assurance that your love endures forever! We thank you that because of your love, you have provided us with salvation and have rescued us from death, hell, and the grave. We thank you that we have a heavenly eternity to look forward to. And even while we live here on this earth, we are the recipients of your enduring love. We thank you for your forgiveness, your provision, your guidance, and your grace to help us navigate our way through each day. We thank you that you will never forget or forsake us. We thank you that even in the darkest night, you shine your light to show us the way. Not only today, but each and every day of our lives, we thank you that we can truly know that your love for us endures forever. I so love days like today! Family, fun, and LOTS of food! As much as I love days like today man they are a ton of work! My dad arranged our annual game of football in the park for 11am. As that may not seem early for most it felt early to me! Before we walked out the door this morning I had to give Makenzie a bath, get her dressed, do her hair, feed her breakfast, get all of her supplies ready along with her chair and out to the car. Then there was the sweet potatoes that needed to be made and a quick stop at the store. We had a GREAT time at the park! My little boys LOVED playing with the big boys! It is so nice to see them doing boy stuff as I can not give that to them as a mommy! So on Thanksgiving I am thankful for all of the male role models my boy's lives! Makenzie and I even got in on a play! They hiked the ball and we got the hand off! Running down the field we went! Makenzie laughed so hard! Touchdown!!! Then we hung out in the cool grass and watched the boys and hung out with Sammy the dog, otherwise known as my brothers only child! Of course dinner was GREAT! Before dinner we all took a few minutes to express a few of the things we were thankful for! There are so many but at that moment what came out of my mouth was my thanks for my kids, family and all of the opportunities that we have had this year to help Makenzie heal! My dad chimed in with thanks for stem cells research! Then he added medical technology! Yes VERY thankful for both of those things too! Makenzie ate with us! It was a great feeling! We stayed to watch the Broncos stomp all over the Giants until about half time and then Makenzie was done! All of the kids are snug in their beds and I am hoping to head there soon! All of my kids have come down with a case of the sniffles and a cough! Pray for health! Pray that Makenzie will stay well enough to continue eating! THANK YOU so much for all that you have done this year to support us! Thanksgiving is here.... again! It seems like this year has just flown by! In the blink of an eye will be Christmas! Scary!!! I have so much to be thankful for! I could write a list a mile long but I won't bore you! I have learned this year that focusing on everything you don't have will make you miserable,but having a thankful heart for what you do have will bring peace and happiness! Now being the human that I am it is not always easy or even possible but I am trying! Over the past 2 years I have grown to love a very beautiful perfect little girl named Makenzie. I say "grown" because I had to get to know her all over again after her accident! Now I suppose everyone would understand if I was still angry, bitter, and sad for what I lost. For the most part I am not! Yes, there are days that I day dream about my daughter and I driving to the spa! I can see the excitement through the sparkle in her eyes! I envision the conversation that would in sue about what color she wanted to paint her nails. I would smile as she begged me for stars and hearts. I can almost hear her sweet little 4 year old voice when we got home, telling her brothers all about our day. I can see her giddy in her princess dress, and fake heels, with her pink and purple nails sporting hearts and glitter! Oh how I long for that day! Today I am so thankful for many different things that make my heart sing just as much! Once again that would be the long list that could go on and on! If I were to maybe give you just the top 3 it would start with how thankful I am for my God and the hope, peace, healing, grace, forgiveness, and blessing he has given to me. Number two would be my kids and my extended family! They bring me so much joy! Number three would be ALL of the other PEOPLE in my life! Yes ALL of you! I am so excited to be having dinner with my family tomorrow! I can't wait to hear all about the annual football game at the park! I can't wait to talk, laugh, and eat some turkey dinner! I can't wait to see Makenzie eat her first Thanksgiving dinner with all of us since March 2007! Makenzie pooped 3...count em ....3 times today!!!! I tried everything but go ole Miralax did the trick!!! So in efforts to get her fully flushed out I gave her another full dose again tonight and hope that we can get to a maintenance dose tomorrow! I have decided that it is pretty sad when you jump for joy because you smell a dirty diaper! However, it was the highlight of my day! Oh the things you take for granted! Makenzie has been doing well with eating! We are up to 6 scoops of Nutra and almost 4oz, per feeding, three times a day! To put this in perspective, I received an e-mail from the dietitian today. In order to get her completely off of the tube feeding for food purposes she needs 25 scoops of Nutra... she is getting 18 right now. She needs 8 1/4 tablespoons of infant cereal. Currently she is getting 6 Tbls. Canned baby food... she needs 25 teaspoons of canned baby food... currently she is getting about 24 teaspoons! WOW!!!! All in a matter of 10 days! God is GOOD!!! She has however been giving me a bit of grief about eating the last 3 days. Not really into it. It has taken a bit longer but we have made it through! It could be because she hasn't had a good BM for several days. I know that would squash my appetite! This morning we finished our last bite of breakfast as her PT was getting to the house. After she worked with her for about 45 min I asked if she had noticed any physical signs or behavior that would indicate that Makenzie's tummy hurt. She said no and then pointed out that Makenzie was laying completely relaxed over the ball. If her belly hurt she would defiantly not have been doing that. So long story short, I think I am dealing with a behaviour issue! Yes, I said it...Makenzie is acting like a 4 year old! My princess doesn't WANT to eat, not that she CAN'T. So I have been patiently pushing her through it. She is still swallowing beautifully, she is not having any troubles keeping it in minus a few spit ups here and there, and now she is pooping! She is so close I can almost taste her success and man am I excited! Please continue to pray for continued improvement! Pray for healing! Pray that on Monday when my mom goes in for her MRI there will be NO cancer cells! Pray for a MIRACLE! Real is tragedy! Real are accidents! Real is sickness! Real is pain. Tonight my mom called to tell me that she has breast cancer. What that means for her is not yet known. She has an MRI scheduled and should give us a better idea of what is going on. Real is that no one is excempt! Real is that life hurts! Real is that I am strong! Real is that my mom is strong! Real is that my family and friends are strong! REAL IS THAT MY GOD IS EVEN STRONGER! Remember your promise to me, for it is my only hope. Your promise revives me; it comforts me in all my troubles. Not much going on around here! Makenzie struggled with eating a bit today but I am thinking it may have a bit to do with the fact that she has not been having good BM's. I did get all of her food in her it just took forever! This is something that I really need you to pray about! She is doing so great! Now we need her system to regulate and be able to go! I have tried a few things and the newest tonight was mineral oil! Pray for the RUNS!!! For my friends and family that have been asking what Makenzie would like for Christmas I have posted a link on the side bar with some ideas! It is very frustrating as all of the toys that Makenzie would really like and can play with by herself have the word "adapted" in front of them which in turn means...... EXPENSIVE! I could have picked out the whole catalogue but I kept it to the more affordable toys that I KNOW Makenzie would LOVE! I really can't believe that Thanksgiving is on Thursday but what I do know is that I I have a TON to be thankful for! This year will be even more sweet as it will be the first year after her accident that she can really eat Thanksgiving Dinner with all of us! She may not be eating all of the same food but she will be EATING! Pray tonight for healing, mostly for poop! TMI I know but really this needs to get ironed out as it can be a HUGE deal and could make her VERY sick if we don't get it more regular! Thank You for all of your prayers and support! Believe! Your Word says that you are the Father of mercies and the God of all comfort who comforts us in our tribulations (2 Corinthians 1:3). Your promises bring hope and revive a weary spirit. You have promised that sorrow lasts for a night, but joy comes in the morning (Psalm 30:5). You have promised to give us beauty instead of ashes, gladness instead of mourning, and peace instead of despair (Isaiah 61:3). You have said that the thief comes to steal, kill, and destroy, but that you have come to give us abundant life (John 10:10). You have promised that to those who fear your name, you would arise with healing on your wings to set us free so that we would leap with joy (Malachi 4:2). Lord, I thank you that each and every one of these promises applies to Makenzie just as much as they do to anyone else. Therefore, Lord, I thank you for the comfort, beauty, gladness, joy, peace, abundant life, and healing you have in store for Makenzie. These are your promises, and it is in these promises that we hold great hope and comfort for ourselves as well. I can not believe that the holidays are here and right around the corner! It turned into somewhat of a festive day around here! The boys had a sleepover last night and bright and early they were up! They had a great time, made a great big mess, and then went off to church this morning to bundle up food that they have been collecting over the last month or so to bring to families in need! Makenzie and I went to a kid's club across town that I found out about a couple of weeks ago geared towards kids with special needs. There were a lot of games, crafts, and of course snack. It was nice. We picked the boys up and headed out to eat with grandma and back home for some cards, gingerbread cookie making, and just hanging out! At the last minute we decided to go out to a local mall for their holiday kick off! Tons of fun!!! Makenzie loved all of the lights and sounds! Lots of holiday songs, Santa, The Grinch, and of course the lighting of the Christmas Tree! It feels so good to do normal things! Yes, it took about 5 extra layers to take Makenzie out in the cold but she was snug as a bug even though she wouldn't leave her hat on! It has been a very emotional week to say the least! I am so proud of Makenzie. My head is spinning in wonder and amazement over God's vivid blessings. So much has happened this week! So much has changed in just a few short days and I am tired! Tired in a very good way! Still in shock! Thank You for all of the prayers and support! Please keep praying! Watching grass grow. Have you ever done it? Well even if you haven't I am sure you know that it grows VERY slowly! In fact I don't think it is even possible to see in real time! Sometimes I compare Makenzie's healing to watching grass grow! She is healing. She is growing. Sometimes as her mom, who is with her 24 hours a day, I don't see everything. I feel like I miss some of the everyday miracles. I am sure you all are a bit tired of the daily "Makenzie is still eating" reports but this is huge and it happened FAST! No grass growing in real time here! This is more like watching the fast motion version on the Discovery channel. To me it is AMAZING! I spoke with the dietitian this afternoon and gave her an update on Makenzie. She told me that I could cut out another 4 oz of tube feeds. This means we are now over halfway in 4 days! I also put her on the scale and she has gained a pound since last week! WOW!!! The new problem is that she has not had a BM in over 2 days! I have tried a RX stool softener that didn't seam to work, I put her in her stander hoping she would go. No can do. Tonight I resorted to the glycerin both in her tube and ...well you know!! I hope this resolves itself by the morning! So as silly as it may sound please pray for poop! Pray that Makenzie body can adjust quickly to this new food and that this problem will not persist! I have had many people ask me if I think that her new ability to eat is a result of the stem cells. My answer to that is most defiantly YES! We have worked so hard for over 2 years to get her to eat and NEVER have we gotten any kind of volume in her EVER! Nor have we made much progress in the past with her oral motor or aversion. She loves to lick things and has taken several bites after which she would get tired, gag, cough, and usually vomit! When we went to Costa Rica they told us that it may take 3 months for us to see improvement and at almost EXACTLY 3 months Makenzie began to eat! I waited for the other shoe to drop as the few times she has showed interest, she has lost it shortly there after when the issue has been pressed. The one thing that has not been revealed to me is why stem cells? I know that my God doesn't need stem cells to heal Makenzie. I know that at this very second he could reach down and touch her, allowing her to stand up, walk, talk and have complete restoration. But that is NOT Makenzie's story. I know God has a plan! There is a reason. What ever it is, to God be all the GLORY!!! One day I hope he will reveal to me the work he is doing through the Stem Cells. Not only in Makenzie but in everyone she has touched and will continue to touch! One day it will be clear to me why he used Stem Cells to bring healing to Princess Makenzie. For today I will just have to be ok with not knowing and continue to follow God's leading on this journey we call life! I sometimes feel like I am screaming but no one can hear me. Like my voice doesn't count. Advocating for a child is VERY rewarding but at the same time can be the most challenging and frustrating thing you will ever face! Some of you can imagine what it feels like to challenge a school district, insurance company, government funding agency, or even friends and family. These power houses want you to seen but not heard. They want to do things their way. They hide behind political red tape and policies. Some care... but not nearly enough. At the end of the day all go home to their own lives and issues and your child is ultimately forgotten. After I received the call last night from the HHC about Makenzie's Neocate Nutra not coming in until after the weekend my heart sank. I left a message with the dietitian at the hospital and looked up a pharmacy I knew carried formula. I got up this morning and called the pharmacy but they did not carry it. I called the dietitian but no answer. I paged her and she called right back. She told me that she had left a message and e mail for the local rep of the company that makes the formula. I knew better then to leave it at that so I called Neocate myself. Within 5 min they had connected me to her and I had made arrangements to go pick up the last can of Nutra she had left!!!! Praise God! When I picked it up I stood and talked to her about Makenzie and why it was so important for her to have this food and how thankful I was that she was able to provide it for my sweet girl. She told me that next week she would be delivering 2 cases to the hospital so if I should need anymore they would have some and told me if I EVER needed anything again to PLEASE give her a call!!!! Thank You for hearing me! The dietitian never did call me back. I am not sure if the rep told her she had talked to me or if the ball was dropped and she went home ultimately forgetting about how important this was to Makenzie. Did my voice get heard? Also this afternoon I met someone with the school district. Lets just say I am about as unhappy as I have ever been about this situation. I will not go into detail but as of right now I have scheduled a meeting with a specialized school. I want to see what they have to offer. Would Makenzie receive more? I don't know but I need to find out. The teachers/specialists/aids are great! They love Makenzie! All of the kids in her class love Makenzie. Makenzie loves to go to school. She has so much fun. The district however doesn't want to do what needs to be done and in my opinion is meeting Makenzie's needs at a very sub standard level. But once again, political red tape, policies, and the need to do things their way. have drowned out my voice... Makenzies voice! I still am not sure why this has to be so hard but it is! I want it to work. Maybe I am asking for too much. I don't think I am. On a more positive note Makenzie ate......drum roll........ 9 oz today!!!!! WOW! She did great in therapy and all in all is still doing fabulous!!!! God is providing and he is in control so I am going to take a deep breath and give the school thing to him! I will still fight but I will not worry. He know right where he wants Makenzie and he will get her there! Trust!!! Makenzie was such a trooper! We started the morning early with Speech, followed by OT, then PT, then Feeding therapy and finally and hour of school! Only to come home and EAT DINNER, take a bath, and off to bed!! Speech went GREAT! A while back I bought some books and I had her therapist put some words in the talker so that she could participate in reading them. So her words are, read to me, lift the flap, turn the page, and the end. She LOVED it! Below is a video of her asking to be read to and to turn the page! AMAZING!!! OT and PT also went well!!! She is doing some AMAZING stuff!!!! Her rolling is so much better, she is using her extent ion a ton better, pushing up prone on elbows and hands... and the list goes on and on!!!! Feeding therapy also went WONDERFUL! We just started this today with a therapist that worked with Makenzie about a year ago. I called her when Makenzie started eating and asked if she would have time to come and work with Makenzie again. She was able to fit her into her schedule once a week and I couldn't be happier! The last time this therapist saw Makenzie was right before we went to Costa Rica! When she walked through the door the first thing she said is "she looks like a different kid!" She mentioned how much better her tone was. How nice her head control was and how great her hands looked! Then we moved on to the business of eating! Maknezie did great and her therapist was SO thrilled!!! Today was AMAZING!!! God is oh so good! Thank You Jesus! I am so proud of my princess!!! I did get a call tonight from our home health care company tonight about the shipment of Makenzies supplement. They told me it would be here tomorrow and the message they left tonight said that it was drop shipped and would not be in until Monday or Tuesday! AHHHHH!! I may have enough to make it through tomorrow! We have cut her tube feeds and changed her whole feeding schedule! She is doing great so this momma bear has a lot to do tomorrow to locate more food for Makenzie as this is not something that can be bought at Target! I have a call into her dietitian to see if we can get some from the local rep, or maybe a pharmacy downtown but where ever I get it from it needs to be here before I go to bed tomorrow night! Please Pray!!!! Also send up an extra prayer or 3 for my mom as she is having some medical issues right now! Pray for healing and peace! Continue to pray for health, healing and continued improvement with eating! God is GOOD! Believe with me! Did you know that if you were to go to Costa Rica in April from here that you could get a ticket for $296.00. This flight would fly through Dallas before arriving in Costa Rica. However if you lived in the South and wanted to drive to Dallas, catch the same flight to Costa Rica on the same day straight through, it would cost you $700. Now how much since does that make? NONE!!! Here's an even funnier scenario. You could fly from Baton Rouge, LA to here through Dallas,leave the next day for Costa Rica, fly back through Dallas, stay in Costa Rica for 7 days, then to do the same on the way home, laying over in Dallas 4 times and hundreds of extra miles in the air and that it would still be CHEAPER! WHAT?!!!! As I sat on the phone with a friend trying to figure out the cheapest way for them to get to ICM in Costa Rica we laughed so hard my stomach hurt! If you were able to follow the above you should be laughing right now too! Also if you understood the last 2 paragraphs you would have gotten that we are planning on going back to Costa Rica in April, God willing!!! We (Makenzie's therapists, doctors, and I) have seen so many good things in the last 3 months and the fact that Makenzie all of the sudden started eating after 2.5 years of wanting NOTHING to do with it, just solidified the whole thing! I am going to trust that God will provide! "Your Father knows the things you have need of before you ask Him." On another note,I am still in shock about both of our appointments yesterday! I am giddy! I feel like a child that asked for a car on their 16th birthday and got it! I have been asking God for this healing in Makenzie for a LONG time and for whatever reason God waited two and a half years, lead us to Costa Rica, and tonight I can SEE God very clearly! I asked for something VERY specific and he answered! I really can't even put into words how amazed I am at the healing power of our Lord! Please continue to pray that Makenzie continues to improve with eating! Again pray that she starts taking in more food...we are up to 2.75 oz at a time, that she isn't burning a ton of calories while eating, and also that he stomach expands so that she can hold the food down! So far so good on that one with just a bit of spit up and reflux! Thanks You all for your prayers! KEEP PRAYING! GOD IS LISTENING!!! I posted this song to the side bar a couple of weeks ago but listen to it again! It moves my heart everytime I hear it and it is so relevent to the day I had today! Then Jesus said to the disciples, "Have faith in God. I assure you that you can say to this mountain, 'May God lift you up and throw you into the sea,' and your command will be obeyed. All that's required is that you really believe and do not doubt in your heart. Listen to me! You can pray for anything, and if you believe, you will have it. So I have totally overbooked this week! I am pretty sure that I have most of it covered and taken care of! Minus of course all of the loose ends that will NEVER end! We had one appointment scheduled for today with GI. Then on Weds we were supposed to have a rehab appointment. That was a huge part of my over scheduling as it conflicted with 3 therapies and a meeting that HAS to happen. Early this afternoon the scheduler for rehab called and asked if I wanted to bring Makenzie in today as she noticed that we were going to be there for GI. I am not sure how or why they knew that but it was a God send none the less! Ok the suspense is killing me! LOL! Makenzie is gaining weight! That is a miracle in and of it self but that is not the BIG news! I suggest you sit down! Makenzie is eating enough by mouth to cut her tube feedings from 32oz to 18oz!!!! That is almost in half!!! This all in a matter of 4 DAYS!!!!! God is SOOOOOO good! I have given this part of Makenzie life fully to him! I have to remind myself of this often but I feel I have done a good job of sticking with it even though some days have been unbearable hard! Days when I just wanted to throw in the towel! I have had to ask God many of times for strength, patients and grace! I have yelled at him, I have praised him, I have cried to him and tonight, well, tonight I am THANKING HIM! To God be all the glory! I think I am still in shock! We then went to our rehab appointment which also went very well. I love this doctor and had a great time talking with her! She said that she thought Makenzine looked brighter, she was sitting up much better and she also got to see her eat. All be it not a perfect pretty sight (eating) her doctor didn't seem to have any concerns! Go Maknezie! We talked about the tightness in her hamstrings and agreed that the next time she gets her tube changed that we will do another round of phenol in her legs. She asked me if I thought it had worked last time and I said I thought so. When I got home I talked a bit with her PT and I asked her if she thought the phenol had worked. She answered me back with a question.... " are you kidding?" LOL "Yes, it worked! and next time I want it in her pecks too!!!" So next time will be soon as her tube was due to be changed Oct 1st! I do not have enough good things to say about her medical team! I love to chat with them and feel like I am heard, respected, and Makenzie is deeply loved by these people! Truly God's hand! Tonight I feel VERY blessed! Tonight I want to ask that you pray for continued healing but more specifically for her eating. Pray that she can start to consume a higher volume so that she can come off the tube!! Also pray that she is not burning a ton of extra calories while eating! THIS IS GOD'S! He has a plan! He listens when we ask, and HE ANSWERS!!! Believe with me! Pray! You are a God who answers prayer. You have promised that you do. God, you know that brain injury looks like an insurmountable mountain. And yet, Lord, you have authority over all the mountains of the earth, and can throw any one of them into the sea. I ask you, Lord, that day by day you will begin casting pieces of the mountain of brain injury in Makenzie's life into the sea. And even though I may not see it every day, I pray, Lord, that you will give me the faith to believe that you are at work. Even on the days when I am so overwhelmed by this mountain of brain injury, give me the faith to believe that the mountain is crumbling and that your mighty hand is at work in ways I could never imagine! Move this mountain on Makenzie's behalf, I pray! I had so much to say about the Expo yesterday but Makenzie had other plans! This was the first annual DME Expo. It was put on by Variety, The Children's Hospital, and Kids Mobility. It was GREAT! Every time I go to stuff like this I realize how many people I know and love meeting new faces! I was able to sit and talk with the Vice President of Snug Seat about some of the problems that we are having with Makenzie chair. He offered to have them fixed and is going to send out the local rep along with the most wonderful seating guy you could ask for from United to get her chair fitted better! WOW! I got our application turned into to Variety for funding on the trike that Makenzie LOVED to ride at therapy earlier this year. A representative from Medicaid was there and I squeezed out some good info on the buy out program and also got a number to someone that may be able to answer some more of my questions from the state. Then I talked a bit with a non profit that does conductive education here. It sounds like a great program but is about and hour plus away. I think I am going to check it out at some point but would probably be something that we would have to do during the summer. Next it was Rifton. Had a talk with them about using a prone stander in supine. They agreed to send my awesome seating guy an actual supine stander to try for a while. My door prize of the afternoon and the perk of closing down the expo was getting to borrow a Kid Walk to try out for a few days! Makenzie has the Pacer but she really liked the way Makenzie looked in the Kid Walk to we are going to try it out and see. Maybe we will ask the school to order her one. Who Knows... we'll see! As I was driving home I was just so overcome with emotion. I never EVER thought that this would be my niche. It is! I so enjoyed my time there! I love all of the people and have a very in depth understanding of most all of it! I kept thinking about why all of those people/vendors were there. Ok yes, it would be a misconception to say that none of it was about advertising and money but really the bottom line is that they were there for MY kid! They were there for this VERY small population that Makenzie fits into! They were there for Cici, Noah, Julia, Emily, and Makenzie! I felt so understood! I was surrounded by people that spoke the language of Special Needs! There were NO stares. Everyone said hi, and I got about a million comments about how beautiful Makenzie was. Amazingly none of them were started or finished with the typical, are you tired?, no maybe shy?, but you are so beautiful! I did not have to explain ANYTHING! LOVE IT! Makenzie did great today as well! She has been eating like a champ! 7oz and over 200 calories! I am so so so so so so so so proud! The last 4 weeks have been long! It has been VERY hard to stick with the feeding thing! There have been many days that I have just wanted to give up! I am so glad I didn't! She is doing so well! She has been eating a bit more then 2 oz without any complaint and doing it very quickly. There is very little gagging and only a cough or too here and there which is amazing! We have an appointment with the dietitian tomorrow. I am hoping that we can come up with a good plan of attack in regards to adjusting her food depending on her oral intake! I am also hoping to get a script for an appetite enhancer. I have heard really good things about this drug and am hoping that it will help! I guess we won't know until we give it a go! It is Monday again and this week isn't looking any less crazy! In fact maybe moreso then most! Oh well! I am sure GREAT things will come out of all of the crazyness! Sorry that turned into a novel! Lots going on! Please keep praying! After a morning of trying to find a sitter, feed Makenzie, get her ready, talking to the GI nurse, pediatrician,and home health care company, rescheduling PT for next week, getting 4 kids out the door into the car, I found myself driving down the highway just thankful I was still breathing! Deep breaths! I made it in record time only to find out the time they gave me was an hour off so I now I had time to kill! HAHAHA!!! Oh well! Then it was back to get the boys and home to feed Makenzie. She ate 2 oz of her new food in about 10 min! That is a record time! I think she would have eaten more but I was so happy with her success that I just quit on a happy note! I am glad that I did stop because she seemed a bit uncomfortable afterwards. This food has a ton of calories in it so I am sure I shocked her stomach! She did not throw up however which was GREAT! I just couldn't believe how fast she ate it! SO PROUD!!! I sit here right now thinking about my day! Thinking about how stressed I was this morning! About how much work it is to do something so seemingly simple. Now my day is done and all of the kids are peacefully sleeping and my day feels like it was all just a dream! Tomorrow will be another day filled with more of the same. We have a DME Expo to go to in the morning. For those of you that wish I would speak in English,... DME is Durable Medical Equipment, ie: gait trainers, standers, wheel chairs, feeding chairs, and much more! There will be many different retailers there with info on funding and product information! I am really excited! I always look forward to adding more info to my arsenal of things that can help Makenzie. So tomorrow will be insane again. "We wait in hope for the LORD; he is our help and our shield. In him our hearts rejoice, for we trust in his holy name. May your unfailing love rest upon us, O LORD, even as we put our hope in you." Thank you that we can put our hope in you, for you are indeed a trustworthy God. And yet, Lord, there are many days when we look to the future and are filled with more fear and anxiety than we are with hope. We have so many questions about Makenzie's future and about our own. But your Word says that if we cast our cares upon you, you will be faithful to sustain us (Psalm 55:22). 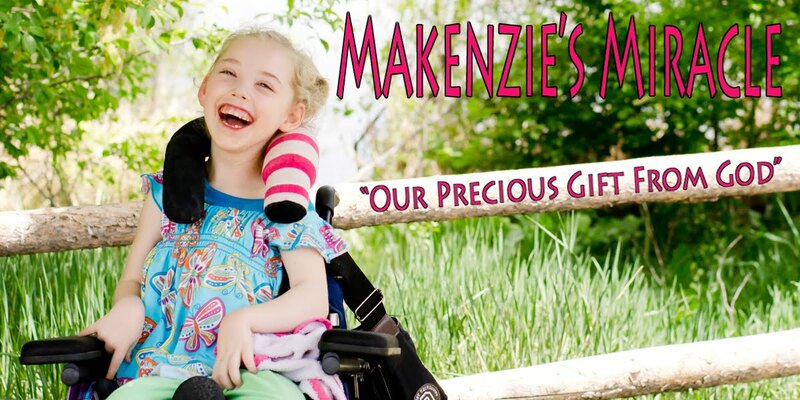 Help us to remember that Makenzie is in your hands, and that you love her more than we ever could. Help us to remember that as we entrust Makenzie fully to you knowing that you can lift her higher than we ever could through our own efforts. Cause our hearts to rejoice in you today, Lord, and to bring us great hope for the days ahead. Well we made it through another day. The boys have just gone to bed because there is no school tomorrow for conferences. I would not be the mother who totally spaced out 2 of my kids conference on 2 different days non the less. Nor would I be the mom that totally forgot that they didn't have school tomorrow. Normally this wouldn't be a big deal other then that I have a training lab at my work in the morning and didn't find a sitter because well..... I FORGOT! Other things I have forgotten this week.... my son had a field trip today and needed a packed lunch. Remedy? Sonic Chicken poppers and tots to the school by 9 am! Oh and I forgot to call Makenzie's therapist to tell her that we were going to miss therapy again tomorrow! I forgot to e-mail a friend from church back to find a time for her small group to bring us some dinners. I forgot to e-mail ICM with some questions I have about our next SCT and I am sure some other things that I forget that I forgot I needed to do! AHHHHHH!!! HMMMMMMMM I think I need a household manager! I did however get something new in the mail today and am so excited! I ordered a sample of a new product from neocate that I hope Makenzie will like. It is a very high calorie, semi solid food supplement. In about 4 oz there is 175 calories. It also contains a ton of vitamins, minerals, protein, and fat! I fed it to Makenzie this evening and she ate 2 oz ish which means she got over 80 calories by mouth!!!! WOW!!! It is a very smooth, some what thick consistency, and she seemed to like it alright! We will try it again in the morning! I have also started to switch her over to a higher calorie formula and she seems to be doing ok with it! This will help lessen the amount of time she needs to be fed at night so that she can be hungry sooner in the day! I contacted Makenzie's GI doctor for some insight on this and his earliest appointment was the beginning of Jan. HMMMMM. I talked to the nurse and the best she said she could do was the middle of Dec. Still not going to work! I am frustrated with this as I really do like this doctor and if it was an emergency I could get in to see him tomorrow but since it is not I just can't seem to get in. This will not wait until then! Makenzie is doing so well NOW and I feel I need to get started on the next step before to long! So I guess I will figure it out on my own!!! Been there, done that in the past, so I guess it will be just fine! I did get to bed early last night but it was a lost cause as Makenzie decided that 5:30am would be a great time to get up this morning, so my extra sleep I thought I would get just didn't happen! I am going to try again tonight. Then get up in the morning and try to find a sitter at the extreme last minute. I am sure none of my friends or family would appreciate a call at 11pm!!! Pray that I get this worked out! Believe! Tonight I am tired...again! I am going to try to get to bed on time. So on that note we had a great day! Makenzie ate well and had a great day in school and at therapy! God is so good and I am so proud of my princess! There are so many times when those around us cannot fully understand the challenges we face day to day. How wonderful it is to know that you not only understand what we are facing today, you also know what we will need for tomorrow. We are deeply comforted in knowing that you have great affection for each member of this family. Thank you, Lord, that we can approach you with great confidence knowing that you will never let us down. Even when answers to our prayers seem so delayed and some needs remain great, we can be sure that your timing is perfect, and that you will always fulfill all of your promises to us. Help us in the tough times to remember that we can trust you because you have promised to make a way even when there seems to be no way. Sitting tall on the ball!!! Playing with my friends at school! I love my teachers! Look at me laugh! Hand over hand! Trying to decide if I like this or not! To down the slide I must first climb up the stairs! Look at me! Here I go! Wheeeeeee! I LOVE THE SLIDE!!!!! Good night all!!! Thanks for all of your thoughts and prayers!